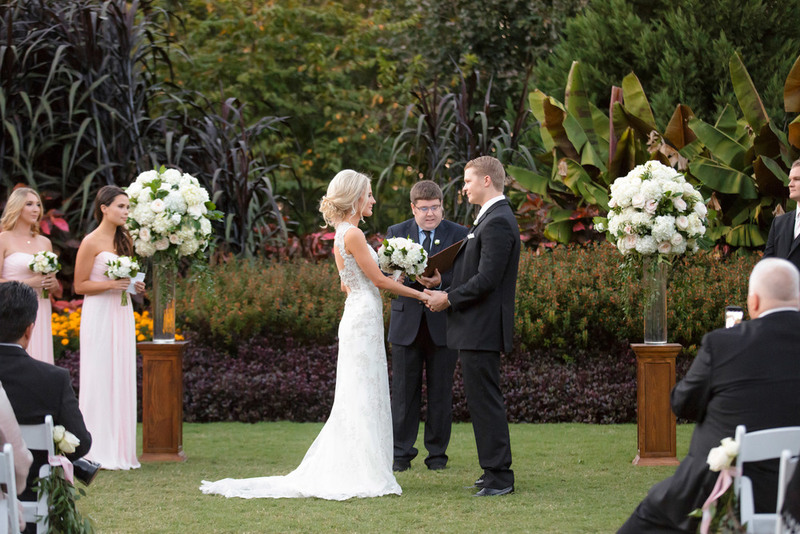 Skye and Andrew were married on a perfect fall day at the Dallas Arboretum and Botanical Gardens. Skye really loves being outside and really wanted an outdoor wedding ceremony with a lot of greenery and natural elements. The Dallas Arboretum fit all of her wishes perfectly! To compliment the natural vibe of the venue, Skye and Andrew chose neutral colors such as blush pinks, ivories and gold for their wedding. Skye worked with A & L Florist to create some amazing centerpieces that featured blush pink garden roses and white hydrangeas. Even their beautiful cake from Elena’s Cakes fit the theme perfectly. It was a five-tier wedding cake with pink roses and white hydrangeas and was iced in a natural and organic way. To add a few personal touches, Skye and Andrew printed little cards that said, “you are one of the reasons why we smile” and placed them at each seat. They also handmade the wedding favors which were Texas Candied Pecans in mason jars tied with an ivory ribbon. All of Skye's planning paid off and with the help of Mayfield Events everything for their wedding day was perfect! All of the wedding guests had a blast and partied into the night to celebrate Skye and Andrew. Congratulations, you two! Here’s to a lifetime of love and happiness!